Home > blog > Do you feel like your garden is a bit of a disaster? Do you feel like your garden is a bit of a disaster? I’m often asked this by people in this very situation, so I thought I’d put together some useful advice that will help you get started. It really helps to start by writing down what you want – it helps to clarify your thoughts and gets you thinking about exactly what your priorities are. Sit down and have a family discussion. Talk through and make a list of all your practical requirements, personal preferences, likes and dislikes etc. Don’t be afraid to add the “Wish List” items as well! A scrapbook or ideas book is a really good thing to start to help you process and form your ideas and clarify a picture of what you would love to see in your garden. This is also a handy package to pass on to your designer to illustrate clearly to them exactly what you are after. To help you envisage what might be possible for your garden try looking through garden magazines, books or websites which have examples of different types of gardens and different elements/ideas. Pinterest and Houzz.com are very useful websites for this and they allow you to create an on-line scrapbook. Alternatively you can of course opt for the good old-fashioned paper, scissors and sellotape version! I personally find these equally if not more useful. There are so many ideas out there so keep in mind whether or not you think they would suit your property – your house, your lifestyle and/or your budget, for example. Remember that a garden should be an extension of the architectural style of your house and also should reflect where you live and the personalities of the people who live there – you! Think about and make a note of any physical characteristics of your property which are of most concern to you. You will have a good “local knowledge” of issues such as sun, wind, shade, privacy/boundary issues etc and can pass this information on to your designer. Also make a note of what is already in your garden that you want to keep – if anything! When making notes of what plants you like try to be realistic and consider whether they will grow well in your garden. Your designer will of course be able to advise you with this but it does help to consider whether the planting style you prefer is going to suit your property and your ability to maintain it etc. Be realistic about how long you want to spend on gardening, maintaining, mowing the lawns etc each month and make a note of this so your designer is aware of your enthusiasm/limitations! Look around on the internet and/or in books which feature local designers (eg: “Landscape: Gardens By New Zealands Top Designers” by Rose Thodey and Gill Hanly) and look at their portfolio of work. See what elements of their designs you really like and think could work in your garden. It is not worth risking going to a designer who doesn’t appear to have done previous work which is similar to what you want – chances are they are either not interested in that type of work or have little experience in it. Either way, they’re not for you! Most designers will have a fairly comprehensive selection of work featured on their websites so potential clients can easily see what sort of design work they are capable of. On my website for example I have many photos of my previous projects so people can get a really good feel for how I work, what styles I have worked with in the past and what types of properties I have done work for. Once you have a really good idea of what you need and want for your property and have found a designer whose work you like the look of the next step is to get them to come out and meet you on site. This is the time to see what ideas they would come up with and to see whether you feel you could work with them on your project. Start by going through your brief with them. Tell them your ideas, the priority issues you want help with, and the type of garden you want. ~Do you like their ideas? Once they have heard what you are after they should be able to come up with some good ideas and potential solutions. ~ Do they seem competent, enthusiastic and positive about the potential for your property? They should leave you feeling inspired and excited about the project you are planning – and confident you are in the right hands! How Do I Work out how much to spend on my garden? This is always a difficult question to answer at the beginning of the design process. Most people have a vague (ie hopeful!) figure in mind but with gardens so much can be done in stages so most people have a less fixed figure in mind than they would for a house design for example. Sadly not many people say “cost is not an issue” either! What is helpful is for the designer to make the clients aware of the approximate costs of each element so they can make an informed decision of whether they want it included in the design. And so it’s really up to me to say that a pool, outdoor fireplace, tennis court or whatever will cost this amount … and are you aware of that? I try to point out the cost implications of significant items to clients early on in the piece as often they are blissfully unaware of these! Often people just look at me with their mouths hanging open when I inform them of the cost of one of these “big ticket items” so then it’s a case of… well, we can’t do that … back to the drawing board! 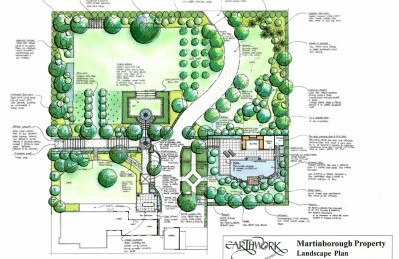 I’ve been doing garden designs now for many years and am able to work out a basic ball-park figure for certain items in that first meeting as part of the feasibility study for what potential customers are wanting. Retaining walls – $300m2 for timber. Using these kinds of average “all-up” figures I can give my potential customers some guidance on whether their ideas are going to be extravagantly off the planet or going to be within what they’re able to afford. The best solution to this age-old problem is usually to stage the project – complete sections of the garden design as money becomes available. In fact most people build their garden in stages so they don’t have to come up the whole cost at once and also don’t need to stick to a fixed budget from the outset. This does mean you can dream a little bigger as long as you understand that it won’t happen overnight! Another option is of course to modify the design to reduce the overall costs. This is best done in the early stages of the design process and is an extremely frequent part of the design process! The skill of the designer is often tested during this process as the challenge is to retain the essence of the design whilst deleting or altering whatever can be “tweaked” without spoiling the overall effect. By way of reassurance may I say that some of the loveliest gardens I have been involved with have been done on quite limited budgets and have relied on the resourcefulness and DIY skills of the clients and a bit of lateral thinking from the designer! Feel free to download my Free Checklist to help you start out, it’s what I send out to my clients to help them get started. You can then pass this information on to your designer.